Not only is today a day for giving, it’s a day to celebrate IWU and all of the things that make it special. Last year, our class had a very impressive 58 donors, let’s try for 65 this year! We contributed $5032. Our goal for this year is $5500! Think of the impact this can make for IWU students and their families! Click here to learn more and to donate on Tuesday, April 3rd. Help spread the word using #AllInForWesleyan and take advantage of our social media toolkit. Amy ’04 and Leo Flores welcomed Elena Grace on September 12, 2017. 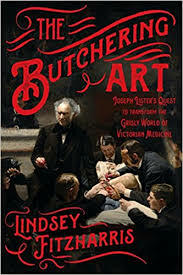 Lindsey Fitzharris ’04 earned the PEN/E.O Wilson Prize for Literary Science Writing for her book The Butchering Art: Joseph Lister’s Quest to Transform the Grisly World of Victorian Medicine. You can read more about it here. 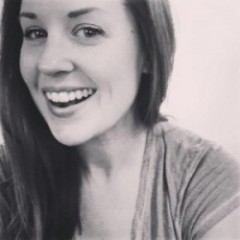 Laine Twanow ’04 (GAIN Assistant Projects Manager, Chestnut Health Systems) will participate in a Psychology career Alumni Panel on February 6th at 7pm in the Welcome Center Auditorium. How well do you know IWU? How well do you know Illinois Wesleyan University? 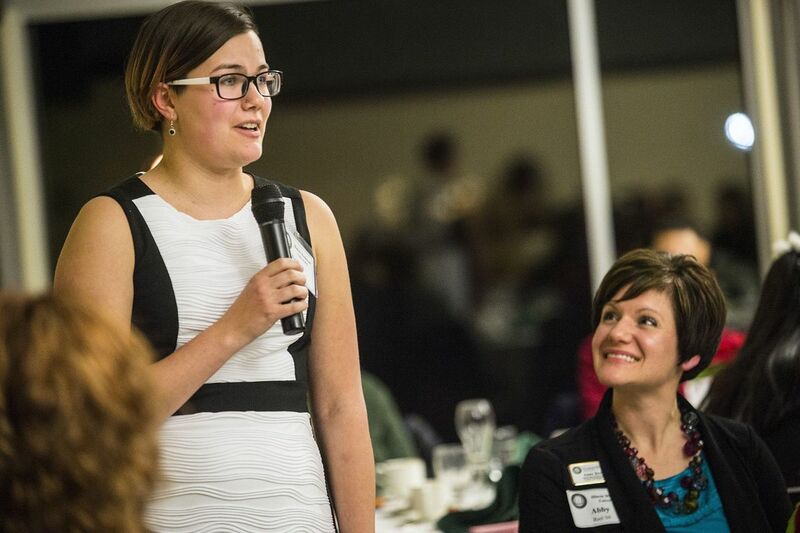 Graduating Illinois Wesleyan University accounting major Audrey Fitzgerald of Yorkville speaks about her guest, Abby Reel ’04, associate director for career development at the IWU Hart Career Center, at a dinner for December graduates Thursday, Dec. 14, 2017 in IWU’s Memorial Center, Bloomington. Thanks for all you do, Abby! The Butchering Art by Dr. Lindsey A. Fitzharris ’04 has been named one of NPR’s Best Books of 2017. Congrats, Lindsey! Happy Holidays Class of 2004! The spirit of giving is all around us this holiday season, please consider giving the gift of bright futures to current and future Illinois Wesleyan University students. Your gifts provide opportunities and experiences that will be remembered for a lifetime. After Black Friday and Cyber Monday is #GivingTuesday, a global initiative to celebrate generosity and give back during the holiday season. 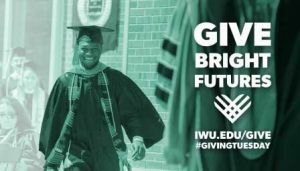 Join the movement and help make bright futures possible for current Titans with a gift at www.iwu.edu/give today! 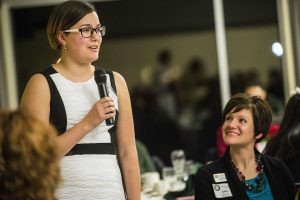 Abby Reel ’04 is leading the efforts to continue the legacy of Conklin’s Barn II Dinner Theater, which was demolished earlier this month, by raising a Barn III. You can read more about the program here, or by visiting their website. Hi, I'm Jennifer, the Class of '04 Newsletter editor. Send me an email at Jenty56@gmail.com if you have an update!